Transcranial magnetic stimulation (TMS) offers the possibility of non-invasive treatment of braindisorders in humans. Studies on animals can allow rapid progress of the research including exploring a variety of different treatment conditions. Numerical calculations using animalmodels are needed to help design suitable TMS coils for use in animal experiments, in particular, to estimate the electric field induced in animal brains. In this paper, we have implemented a high-resolution anatomical MRI-derived mouse model consisting of 50 tissuetypes to accurately calculate induced electric field in the mouse brain. Magnetic field measurements have been performed on the surface of the coil and compared with the calculations in order to validate the calculated magnetic and induced electric fields in the brain.Results show how the induced electric field is distributed in a mouse brain and allow investigation of how this could be improved for TMS studies using mice. The findings have important implications in further preclinical development of TMS for treatment of human diseases. 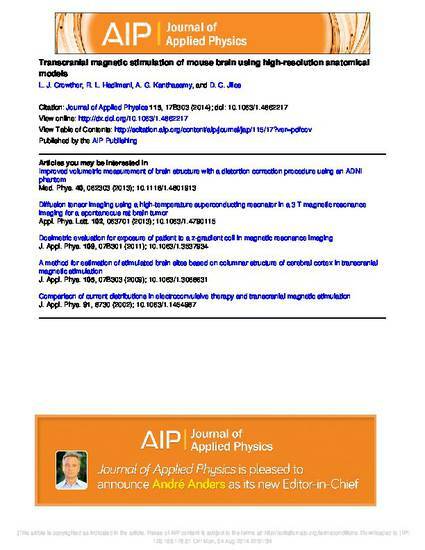 The following article appeared in Journal of Applied Physics 115 (2014): 17B303 and may be found at http://dx.doi.org/10.1063/1.4862217.